Solid-state shear pulverization (SSSP) is a novel mechanical process that uses a modified twin-screw extruder with cooling zones to maintain the polymer in the solid state during processing. High shear and compressive forces result in repeated fragmentation and fusion of polymer in the solid state producing excellent mixing and dispersion of polymer blends and nanocomposites. The SSSP process has been shown to yield nanostructured polymer blends and nanocomposites that cannot be made (due to kinetic and thermodynamic barriers) using conventional processing techniques. SSSP of PS/PMMA blends yields material with quasi-nanostructured morphology and dispersed-phase domains exhibiting length scales of order 100 nm or less. However, the pulverized blend exhibits significant coarsening of the dispersed-phase domains during static annealing, leading to loss of the original nanostructure. Addition of S/MMA gradient copolymer material during pulverization yields a nanostructure nearly identical to that of the blend without copolymer and a near total suppression of coarsening during annealing. 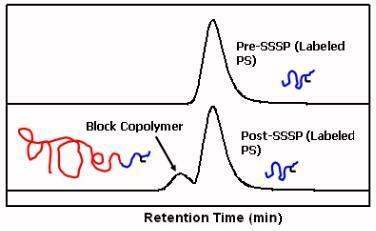 Studies of SEBS triblock copolymer addition to a PS/HDPE blend demonstrate partial to full blend compatibilization. 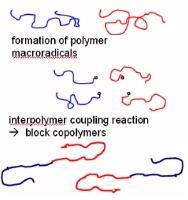 In contrast, much weaker compatibilization effects were observed for the addition of block copolymer during melt processing. 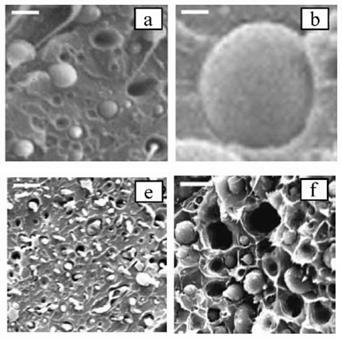 The image shows micrographs of an 80/20 wt% PS/HDPE blend without copolymer before (a) and after (b) annealing, as well as a blend with SEBS triblock copolymer before (e) and after (f) annealing. SSSP was used to prepare blends or composites of polyethylene (PE) and starch. This solid-state process resulted in damaged granular structures (surface roughening, cracking, and clustering), a result that is not achieved in polymer/starch blends made by melt mixing. This is the first time that damage to starch granule morphology has been reported in polymer/starch blends or composites. 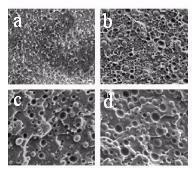 These morphological changes result in improved permeation and mechanical properties compared to the melt-mixed blends. The images show as received starch granules (left) and HDPE/starch blends made by pulverization (middle) and melt-mixing (right).